First of all my Ugadi wishes to everyone !!!! 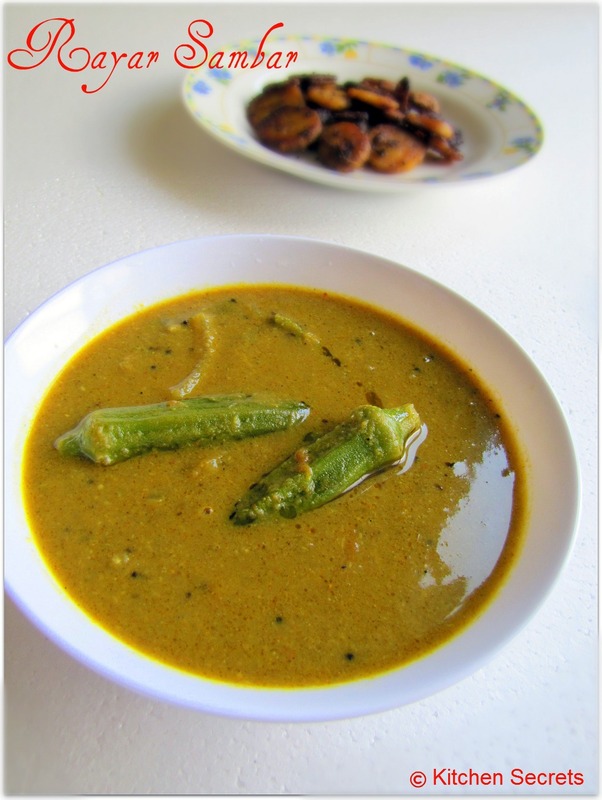 Hope many of u might have known abt this sambar , bit time consuming but worth the try . Adding grilled onion paste along with coriander leaves paste is truly sensational and makes the kulambu very very flavourful. Definitely my home was filled with aroma and my H entered smelling and asked me " whatz this ? Did u make anything new today ?" Sure , I reserved some and relished all thro the week. Note: Reference: Hemant's cookery corner n my hometown neighbour. Hope u njoy as well..
Okra -- 4 to 5 nos. Pressure cook the dhal with tomatoes n turmeric powder for 3 whistles and mash it. Grill the onion with the skin on until onion turns soft and cooked for almost 10 minutes. Grind the coriander leaves and coconut seperately. Soak the tamarind and squeeze the pulp. Mix the sambar powder n salt with the tamarind pulp. Boil the tamarind pulp mixture along with the veggies by adding a cup of water. Grind the grilled onion without adding water to fine paste. Add the boiled thuvar dhal mixture into the boiling kulambu and let it boil. Now add the ground onion paste and let it boil for 5 minutes. Pour in the ground coriander paste once the grilled onion masala completely blend with the kulambu. Cover and continue to cook the kulambu for 2 more minutes. Finally add the coconut paste and again give it a boil. Heat oil seperately in a pan and do the seasoning with mustard seeds , curry leaves , onion and green chillies. Pour the seasoned mixture into the kulambu, mix well and serve..
Rayar sambhar is new to me... bookmarking and gonna try sometime... wow..
looks very tempting!...well we have to go thru the lengthy process to get something truly sensational! sambar looks very yummy n delicious ! Happy ugadi to your and your family. Rayar sambar looks yummy. It is lengthy but always tasty. happy Ugadi dear !! sambar looks so delicious !! This is one great looking Sambar...Lovely!! Very different and tasty sambar! Slurp! Happy Ugadi. Rayar Sambar is too delicious. Sambar looks absolutely irresistible, worth to try..
delicious sambar....perfect with rice n curd. Happy ugadi to u too!! And this sambhar looks definitely worth the effort!! wow...sounds intersting...will give it a go..! Wow...what an awesome looking sambar!!!! Is it something like an Ugadi special? Also, please let me know which ingredients you could not make out in the 'Chuna maccha curry'...would love to help you!! Delicious sambar. Looks very tempting. The sambar looks so royal and divine. Sambar with grilled onion is very new to me..looks absolutely delicious and sounds so flavorful n yumm!! new n delicious sambar..bookmarked it..
Actually This is originally my recipe which you would find in Hemant's cookery corner. This recipe was taught to me by a gentleman on a train journey about 35 years ago.